is aboard the PeruRail Titicaca. and visiting the world’s highest navigable lake, is made even more magical aboard PeruRail Titicaca. This train was created to provide passengers with all the luxuries they could want in a trip, while offering them a chance to forge a mystical connection with nature. panoramas. The route covered by the PeruRail Titicaca train is considered by many travel magazines to be one of the most beautiful in the world. The once-in-a-lifetime adventure lasts approximately 10 hours 30 minutes. 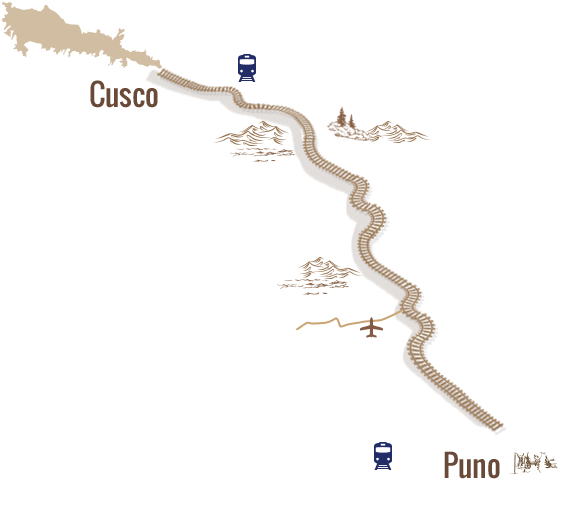 At the start of the journey, you are welcomed at the Wanchaq Station (Cusco) or the Puno Station, where local musicians will provide background music as you board the train. Once aboard, you can enjoy the two dining cars decorated in the style of the Pullman cars of the 1920s. Also, during the trip, you will have the finest in gourmet food and indulgent afternoon tea. The quality of our personalized service is guaranteed. You can bring your carry-on bag aboard the train, and the rest of your luggage will be stored safely on the luggage car, where it will be carefully received and stored. 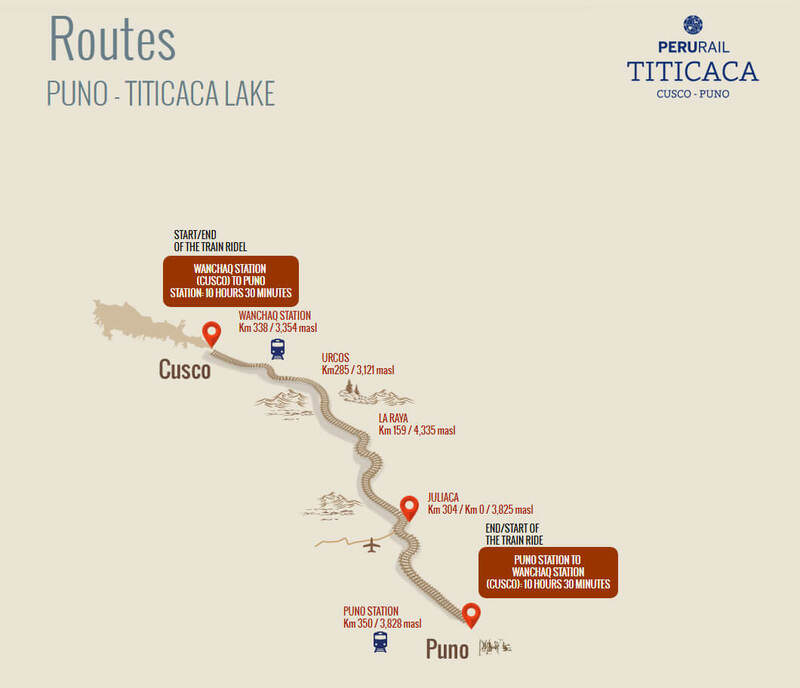 For more information on what is and is not included, depending on the type of trip to or from Puno, we recommend reviewing the “Service Details” for the PeruRail Titicaca train by clicking here. Daily throughout the year, except Tuesdays. 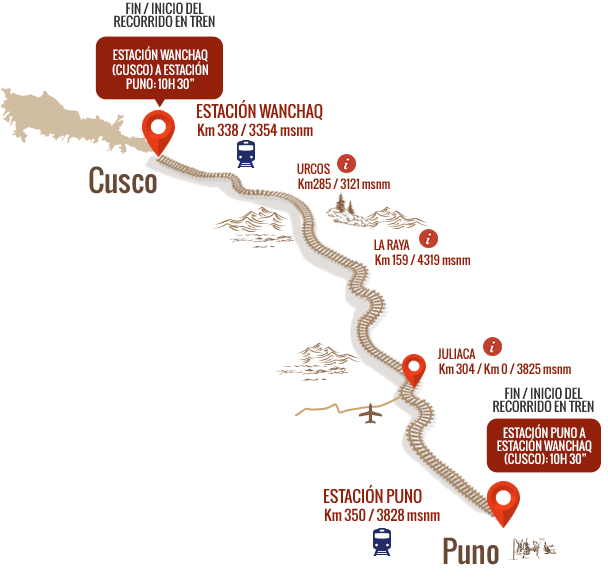 Do you want to know how to get to Cusco?